At the southwestern part of Paros, in walking distance from the sandy beach of Makria Miti and in a short distance from the picturesque small port of Aliki with the restaurants, luxurious stone house 277m² in a land 2546m² with swimming pool and stunning view to the light blue of the sea. In a quiet area on a hill, at the southern part of Paros, surrounded by the wonderful natural island scenery and with a stunning view to the Aegean Sea, stone luminous house 150m² with independent guest house in land 1000m². Close to the picturesque small port of Drios, literally some steps from the water, villa 173m² with stunning view to the crystal clear water of the Aegean Sea. The villa includes 4 bedrooms and 4 bathrooms. At the southern part of Paros, very close to the picturesque small port of Drios, literally some steps from the water, villa 173m² with stunning view to the crystal clear water of the Aegean Sea. The villa includes 4 bedrooms and 4 bathrooms. 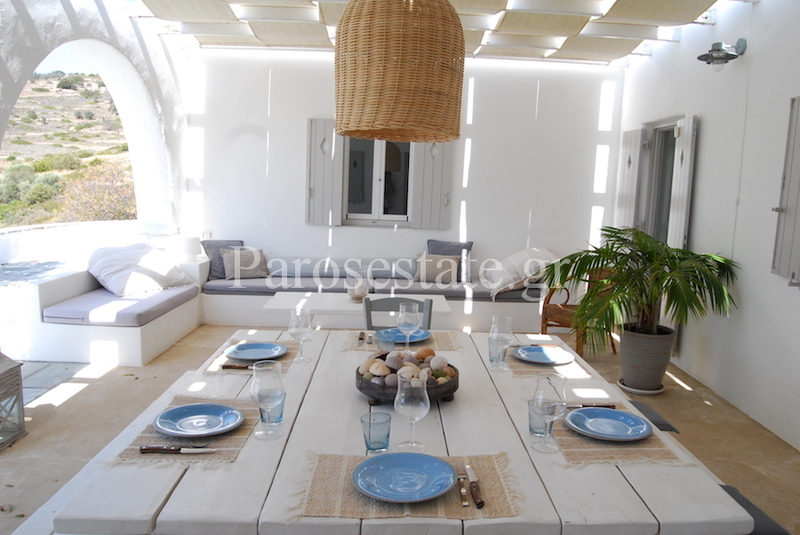 In the southwestern part of Paros, near the picturesque port of Aliki with the coastal tavernas and the beautiful beaches of Faragas & Voutakos, is located the traditional house 188m² built in 2 levels.